iOS 10 is considered an update? As every week goes by, I wonder more and more why iOS 10 is considered an update. Discovering problems, unnecessary changes, and things that make you scratch your head has become a regular occurrence for me. Before I start my rant, I will gladly say that even with the problems, I still much prefer the iPhone over other smart phones, and there are some other great things that have kept me an Apple user. But I have to ask some questions and get some things off my chest because I know I cannot be the only one who feels this way. I will start by mentioning a few small annoyances with iOS 10 that are sort of petty (I will admit that) but should be customizable based on the users preferences. - The calculator. Why does it now make a keyboard click even when I have keyboard clicks off. Why? If people need to hear a keyboard click on their calculator, they should be able to make that change themselves. Meanwhile, you force an entire community to have to listen to it unless they silence their phone. This ticks me off because I realized I had to silence my phone and what happened? I missed a phone call. Yeah, not the end of the world, but falls under my main point of this whole post, completely unnecessary and should be customizable instead. - The super big font on the home screen for music. Why isn't this customizable? I like using smaller font on my phone and I know others like the font bigger. Not a big deal but shouldn't this be a choice under settings? I do like the play/music buttons being bigger but I can see why others might not. I read somewhere that apple did this to make it easier for people to hit the button. That makes sense so that brings me to my next point. - The new iMessage screen. I absolutely cannot stand it. This might be a small deal to some people but not to me. The two photos below illustrate my point completely. They want to make buttons bigger and easier right? Well then why is the message button so small and hard to hit with your finger now? What's with all these designs, stickers, exploding images, and gifs? I am 30, not 10 years old, I don't need those stupid additions. Again, they should be customizable based on the users preferences. Now I will say I don't mind the manual written keyboard when you flip the phone sideways and the same goes for the new emojis. But thats it, drawing a message and a few new emojis? That's what I downloaded an entire update for? I have yet to meet a single person that uses the App Store button when inside iMessage. I don't believe that change improves your iMessage experience even 1%. - Along with the increased app freezes and unnecessary added additional steps, I have one more particular issue to mention that is a HUGE deal to me. The new alarm on iOS 10. I don't know about any of you, but I use this as my wake up in the morning and never in many years did I ever have a problem with it waking me up. It was as good as it gets, which is helpful for me instead of an alarm clock because I tend to fall asleep in multiple places in the house. What did the update bring us? Now, for some odd reason, you can disable your own alarm from snoozing without even knowing it. Yes, someone half asleep who likes to snooze, now cannot do so with the comfort of knowing the phone will end up waking them up. In the last two weeks, I have had this problem THREE times. It has worked just fine some days and other days not so much. Now, here's the thing. In the past, I have always pressed any button to snooze and it's worked like a charm. Volume buttons, home button, top button, it didn't matter. Now, apparently some buttons shut off your alarm completely. The problem is, how in the hell are you supposed to know that when you are half asleep and a very hard sleeper? I've went online for help regarding this issue and all I can find is where people say you can grab the phone and push the snooze button on the screen. Well that completely DEFEATS the purpose of even snoozing in the first place. That's also ridiculous even before I mentioned that I am legally blind in both eyes so when I wake up in the morning, I can hardly see anything on my screen until I put on my glasses or contacts anyways. Snoozing should work. Why was this changed? I wish I could even begin to fathom this change. If there was even one answer out there that made some sense, I would be open to hearing it and gaining some more understanding. But I really don't think it exists. Again, this should be one of those things that are CUSTOMIZABLE based on users preferences. NOT forced changes that we all have to deal with. So what do I do now? I set multiple alarms so I can enjoy my snooze if I so choose to. Shouldn't be that way but unfortunately there is nothing else I can do. There were other little things that I don't like about iOS10 but at least those things were customizable. The finger pushing down the home button, you could go into your settings and fix that. Isn't that what you should be able to do with other things you don't find helpful? Now that brings me to my final point: Aren't updates supposed to make the product better? More advanced? More customizable? Things that make you realize just how great technology is as it advances? None of these changes really do that for me. Plus, all these updates take up more space on my phone, so I am using up more space for things I don't use. It hasn't made me feel that this product is improving. I can honestly say that it makes me believe that the developers change things just to change them. They focus on fixing what doesn't need to be fixed while ignoring other issues. So next time the stupid little thing comes across the screen it tells me to download this "update", I will tell myself that it probably isn't worth it to download the "downgrade" because that's what it truly is. A downgrade = few improvements while handfuls of things get worse. I know some of you will just say "deal with it" but this shouldn't be how it is. We should advocate for real change that makes these phones more customizable and better for everybody and not just some of the population. 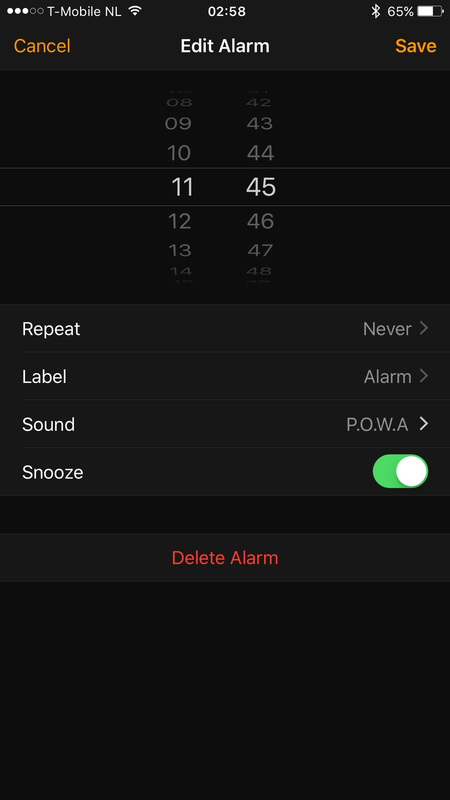 You can enable or disable snooze for alarms per alarm. Edit an alarm and enable snoozing. Do this for all alarms you have. I am not familiar with snoozing being disabled by hitting any button except for the one on the screen. I agree on a couple points, but for the most part, I like the new features in iMessage. I've been using the alarm for years with no issues. - The new iMessage screen. I absolutely cannot stand it. This might be a small deal to some people but not to me. The two photos below illustrate my point completely. They want to make buttons bigger and easier right? Well then why is the message button so small and hard to hit with your finger now? The next time that you want to compose a message, put your finger in the target text area and slide to the left. This will hide all of the iMessage junk. I agree that these iMessage extras should be allowed to be hidden by preference. Yeah, I already have this selected on my alarm. I assure you I have never had a problem with my alarms UNTIL this update so I am confident that there was some change. Maybe others didn't notice because they didn't use it the same as me. Thank you for your suggestion and help though and if you think of anything else I appreciate it as I am all ears on whatever can make it better. I'm torn - Should I pull the trigger on an Apple TV or not?! Should I upgrade to iOS 10?